This retro glass table with six matching chairs is a great addition to our large range of vintage and industrial furniture. The smoked glass top table sits on a wood, chrome and acrylic base. It also comes in two separate pieces for ease of transportation and reassembly. There are some slight scratches on the glass table top which is to be expected. 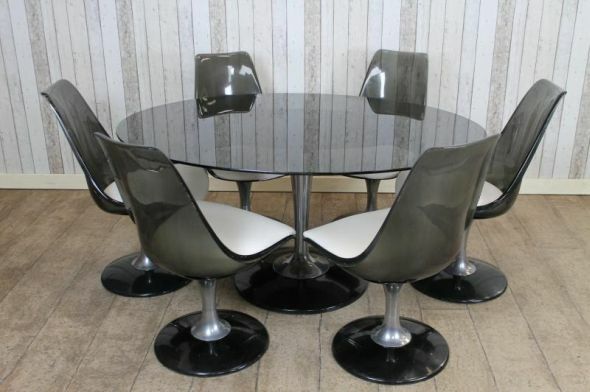 There are also six smoked grey Lucite swivel tulip chairs. These have been re-covered in a pale cream faux leather. The chairs are very solid and durable, and can easily be re-covered by yourselves to suit your interior. A couple of the chairs have small chips in the plastic which we feel adds further character to this vintage dining suite. One of the chairs also has slight movement in the base. There are signs of general wear and tear to the plastic, and a very small chip to the edge of the table (although nothing significant). An ideal collector’s piece for any vintage retro or industrial interior.